Yesterday, Starbucks officially arrived in Colombia. After years of keeping the multinational specialty coffee powerhouse at bay, Juan Valdez will no longer be able to avoid battling Starbucks in its native market of Colombia. Starbucks, after being challenged by Juan Valdez in the US market in the early 2000s, and trying its own marketing foray into now defunct specialty coffee concept (15th Avenue Coffee), has launched its first retail coffee bar in Bogota, Colombia. Instead of running from what many perceive as its strongest asset, the Starbucks brand, Starbucks is fully featuring its logo outside of this centrally located destination. Perhaps after completing decent market research, Starbucks realized that many in the growing global middle class aspire to an affluent lifestyle characterized by iPhone ownership, Starbucks specialty drinks, Coach products, and other premium brands. One of the most attainable products accessible to any income bracket is a simple cup of coffee and a snack. Juan Valdez, with its elegantly designed retails stores, has long taken advantage of growing wealth and a cultural disposition towards public life –of which the coffee shop culture plays a role. Since 2002, Juan Valdez retail locations have represented a place where folks can meet for business, for spending time with old friends and family, or on a date. It is seen as hip for younger generations while also as respectable and safe by older generations. It is also a source of national pride. In reality, Colombia has been ripe for the arrival of Starbucks for a decade, but the terms of that arrival have constantly evolved. This is emphasized in the version of Starbucks launched in Bogota, which is clearly meant to improve upon the Juan Valdez concept. They are aiming higher in terms of premium status, and likely want to differentiate Starbucks from Juan Valdez along those lines. In the short-term, it is likely that Starbucks will focus its Colombia expansion on only the most desirable, high-end, urban locations in order to solidly establish the luxury brand concept. It remains to be seen whether they creep down the price continuum to “Starbucks Express” and kiosk locations in a market that is already saturated with Oma and Juan Valdez competitors. There is nothing economical or middle class feeling about the Parque de la 93 location of the new Starbucks. Although a fairly small, quaint and stylish area, it is essentially a mashup of Georgetown DC and Central Park West NY (Embassy Row clientele mixed with the wealthiest from the nearby financial district). No doubt, there may some Starbucks clients that struggle internally with whether to support their homegrown hero, Juan Valdez. Although, in the end, it appears that the Federation (Federación Nacional de Cafeteros) ensured local growers would benefit regardless of the new competitor– Starbucks in Colombia claims to source 100% of the coffee used in Colombia from Colombian growers. Starbucks’ unambiguous strategy to rapidly expand in Colombia, Brazil and throughout the region, could negatively impact the bottom line for Procafecol S.A., the parent company of Juan Valdez stores. In fact it could be devastating for an enterprise that claims to be preparing for an IPO and has struggled in its attempts to expand in the US and abroad. For more pictures and the official press release from Starbucks, click here. It looks like 10 out of 16 spots on this list still need to be visited/hounded. Much work to do! 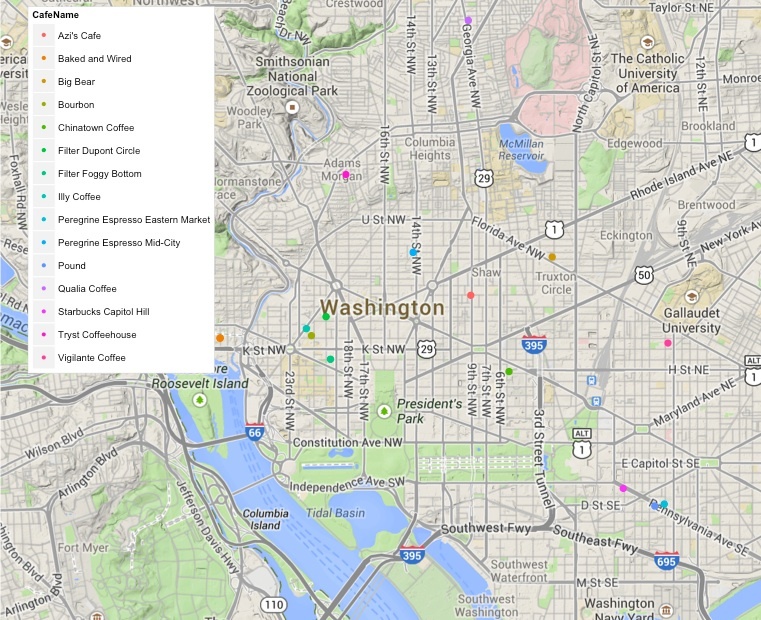 Map of DC coffee shops previously hounded or on the short list to be hounded. As I gear up for a well-deserved break — and return to the origin of my coffee inspiration — I leave you with a couple inspirational coffee-themed independent TED talks. I’m reading “Zero History” by William Gibson. It is the last book of a trilogy that pretty much predicted YouTube and applications like Layar before there was any reasonable way for either to exist. And, yes, he gave us the term “cyberspace” in 1982. I love the term “gone walkabout.” No offence to my fellow NPD bloggers but that little snippet is likely the best writing you’ll come across in this or any NPD blog. For the past couple of years, I’ve included my own little riff on this in presentations I’ve done at conferences. In 1997, when I was meeting with folks from our various European offices to brief them on CREST foodservice industry research and how we use it to help the industry make decisions, an Italian guy in the audience raised his hand and said “that chart is wrong”. We were looking at a chart that showed how consumers in the US consumed coffee. It showed the dayparts. It showed the restaurant channels. It also showed where consumers actually drank their coffee. That part of the chart showed that about 40% (maybe more, I don’t remember exactly now) was consumed off-premises…on the go. My colleague said that this couldn’t be correct. ”Coffee is not for carrying! Coffee is to be ordered from a bar and consumed at the bar or at a table, with someone.” We discussed the issues and concluded that the chart was correct and that Americans were ridiculous, which I’ve found is a satisfactory conclusion to conversations for most people in the world. Further to this conversation, I heard a presentation by a woman named Vanessa Kullman, the founder of Balzac Coffee in Hamburg. She told the story of how, interviewing people walking by the front door of what was to be her first shop, they universally rejected the idea of buying coffee in a paper cup and taking it away. She had to buy the cups and tops in the US and warehouse them in Germany because there was no European source. At the time of her presentation she had over 50 shops. Gutsy. But: in 2000, as the chart below shows, nobody bought coffee to go in the countries we track. Today, a huge chunk of Northern European consumers buy coffee to go. Coffee hasn’t just “gone walkabout” in France. It’s everywhere. And, it’s not just a global brand that did it, Vanessa Kullman and other gutsy business people did it all over the place. Awesome service, attention to coffee, and people. Kris checked this place out when stopping through Santa Cruz while galavanting through California per usual. The life of a professor… The atmosphere at Verve is relaxing in true Californian style. Plenty of natural light and wood and metal decor reminiscent of Urban Outfitters in its layout. The shop is located only a couple of blocks from the Pacific Ocean, which undoubtedly adds to the tranquil feel. The beans are roasted next door in their own facility – it appears they also sell wholesale across the country. Check out their website to make sure. Verve is among the most raved about roasters in the continental US and their baristas are talented enough to consistently make a splash at the annual SCAA barista competitions. Unfortunately for Kris, during his visit the top baristas were actually in Houston competing in the SCAA annual competition on the national stage. The staff are super fun and friendly and the wifi is very, very free. Two paws up for this place. We look forward to continuing to sample their coffee throughout 2012! Groovy spot in Phoenix suburbs. Kris visited this spot in December 2011 and noted that they roast coffee on site every other day in small batches. Echo, owned by Steve Belt, opened in mid-2010 by the inspired graduate of Tempe, Arizona’s major university, Arizona State University. Make sure to check this place out if you’re stopping through!